Grass-fed beef offers you more "good" fats, and fewer "bad" fats. It is high in Omega 3 fatty acids, vitamins and antioxidants. Our Grass-fed beef is totally natural and does not contain traces of added hormones, antibiotics or other drugs. 2. Grass-fed beef is more humane. Grass-fed cows have a dramatically better life when compared with grain-fed cows who spend the vast majority of their life in distant feedlots raised in confinement. 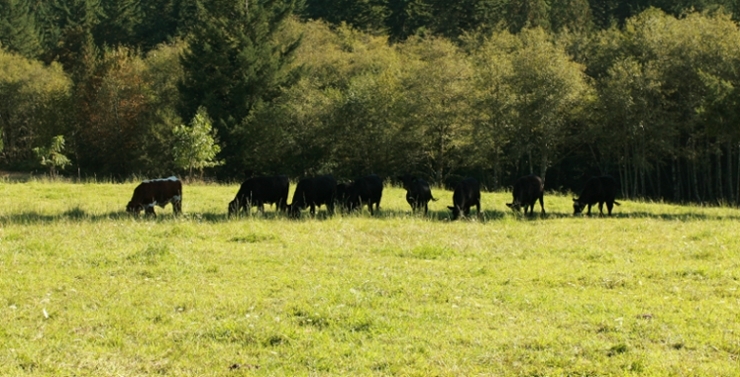 Our grass-fed cows remain on the pasture their whole life, they roam around in sunshine and clean Pacific Northwest air, and their diet is what it was always meant to be: fresh pasture and hay. Our grass-fed cows do not partake in the daily stress of modern life. They don't need drugs and antibiotics to keep healthy, and their growth is determined by genetics, not by genetically modified, growth-promoting hormones. You will be able to taste a difference. Our meat is lean and tastes the way beef is supposed to taste. Once you have tried a perfectly cooked grass-fed steak you will be an instant convert! 4. Grass-fed beef is more environmentally responsible. Buying direct from a local farmer/rancher helps reduce wasted energy. You get your meat directly from our local butcher with no middle men. This is extremely efficient, and helps reduce emissions and pollution. 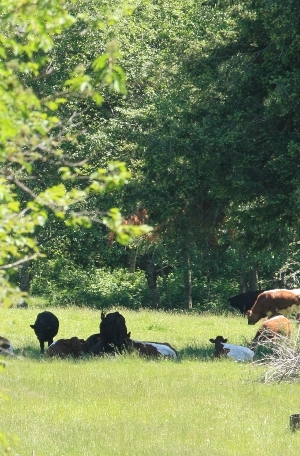 Our animals are raised on local grasses and moved from pasture to pasture preventing overgrazing or waste runoff. We don't use chemical fertilizers or pesticides to maintain our pastures. Instead we fertilize the ground naturally with the manure from the cattle, and every year, we are building up the quality of the soil. Our goal is to pass on better soil and a better environment to future generations.